ON THE CHRISTIAN’S TASK OF DAILY CONVERSION AND INTERIOR STRUGGLE TOWARDS THE ENCOUNTER WITH JESUS CHRIST. Dear friends, below you have some ideas of Pope Francis’ homily at Santa Marta on Oct. 22, 2015, where he reminded us of our task as Christians to strive daily in order to live a life of holiness with the help of God’s grace. 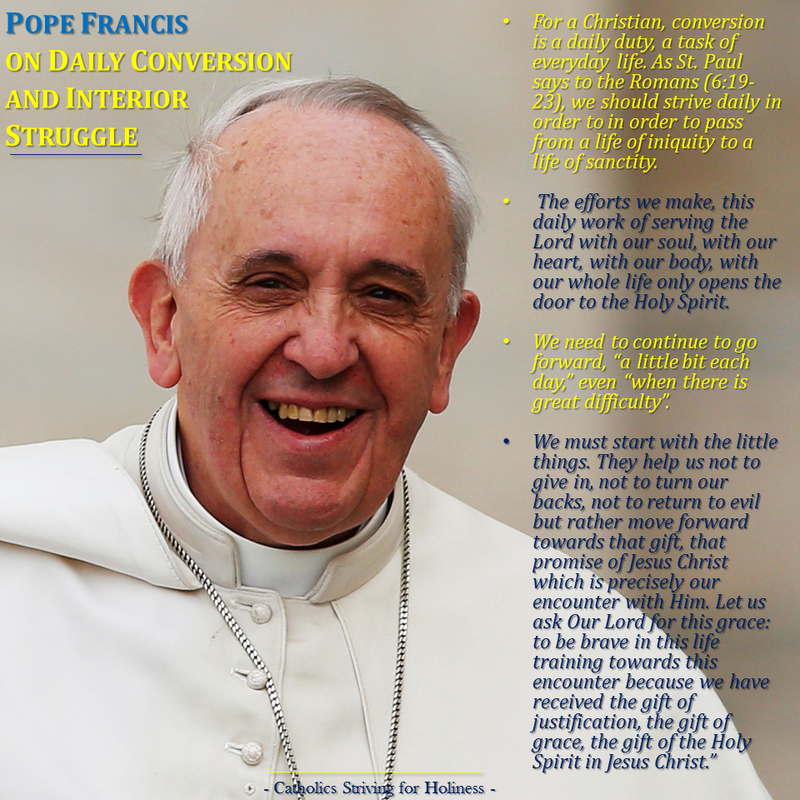 For a Christian, conversion is a daily duty, a task of everyday life. As St. Paul says to the Romans (6:19-23), we should strive daily in order to in order to pass from a life of iniquity to a life of sanctity. Paul makes use of the example of a sportsman, of the man who trains himself for the game and makes a huge effort. This is what an athlete does to win a match; but what about us, who should be striving to win that great victory of Heaven? What should we do? Saint Paul, the Pope said, “exhorts us to go forward with this effort”. OUR DAILY EFFORTS OPENS THE DOOR TO THE HOLY SPIRIT WHO SANCTIFIES US. IT IS NOT AN EASY TASK, BUT WE SHOULD KEEP ON MOVING FORWARD A LITTLE BIT EVERYDAY IN THE LITTLE THINGS. It is a difficult task because of our weakness, of original sin, and the devil always pulls us back. The author of the Letter to the Hebrews warns us against this temptation “to turn back”; he warns us “not to go back, not to fall.” We need to continue to go forward, “a little bit each day,” even “when there is great difficulty”. ALL OUR EFFORTS, WITH GOD’S GRACE, TO OVERCOME THE TEMPTATIONS WILL LEAD US TO THE ENCOUNTER WITH JESUS CHRIST THROUGH THE HOLY SPIRIT. A blessed weekend to all! THE BLESSED VIRGIN MARY, MOTHER OF GOD. This is what the Catholic Church teaches and what we Catholics believe.